(Newser) – A legally blind Michigan woman who wanted to see the world before completely losing her vision has been missing in Peru for a week, and family members are extremely concerned. Carla Valpeoz, a 35-year-old social worker from Detroit, visited the country with a friend for a wedding and was supposed to meet her in Lima after doing some solo traveling in the Cusco area, the Detroit Free Press reports. She texted her friend on the evening of Dec. 11 to tell her about her visit to Machu Picchu, but she missed both her Dec. 13 flight from Cusco to Lima and her Dec. 15 flight back to the US. 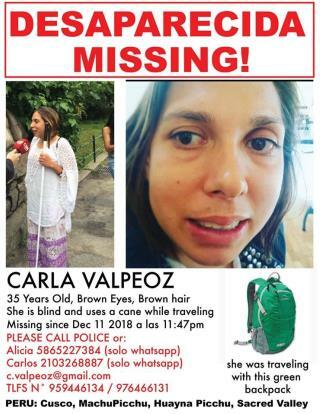 She was last seen leaving a Cusco hostel early on Dec. 12 and taking a taxi to an area where people catch buses. As a petite woman who has traveled alone to faraway places, I felt safer in hostels than I did in regular hotels. Hotels have long, deserted hallways where you could be yanked into a room and no one would hear you scream. In a hostel, there are lots of other people around and no rooms to yank you into, usually. That said, when you're traveling alone and you're small enough for a man to easily throw you over his shoulder, you have to always be wary, mindful, and prepared, so you take routes that take a little longer but afford better safety conditions, you make female friends and go with them shopping and exploring, and you don't act like prey, isolating yourself, being oblivious to your surroundings, taking rides alone with strange men. This young woman should not have been traveling alone. I understand why she did, but it would have been much wiser to be with a friend. Peru again. My big strapping sighted son went there with two big strapping sighted friends but still got ripped off by tour guides and baggage handlers at airports in the interior. Peru is not about Machu Pichu, it's about taking your life in your hands. I can't imagine this blind woman NOT being taken advantage of in that savage land. There's a large school for the blind somewhere around Boston with beautiful, extensive landscaping. And every time I drove by all I could think was, "Who's the landscaping for?"